This oil started with that bright yellow sky. Since this is a 24 x 24 image, things can happen really fast and they did! I was searching for a means to create the opposite of that bright sky, something dark, by using a line of colorful trees. A number of tree patterns came and went until the present shape emerged with that dark reveal at the base of the trees. The foreground went through of permutations as well, with a number of complex to simple arrangements being tried out. At one point during the creation of this I realized that despite the scale, the time involved was the same as a much larger oil. It was still a 500 piece puzzle, so to speak, but the pieces were just smaller. 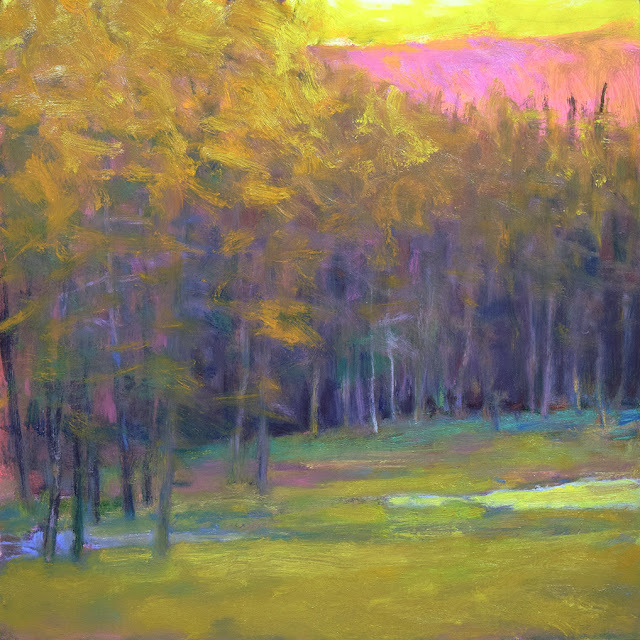 The work finally started to come together with the addition of the hot pink and purple in the distant hill and a generous about of ochres and yellows everywhere. I thought it was done and left it for a couple of days, but seeing it fresh in the studio again it came off just a bit too monochromatic, so the greens and blues were added just under the base of the trees and at the bit of standing water in the lower left. ...looks like a good idea for a much larger oil.